Super Cute Purses for Girls from Poochie and Co.
Alyssa has gotten on a purse kick, where ever we go she must bring a purse with her. I am totally fine with that however I want her to have have a purse that is geared for her age and one that she will enjoy. Of course she loves walking around carrying my purse but a Coach purse is not what I want my 3 year old to be carrying around. 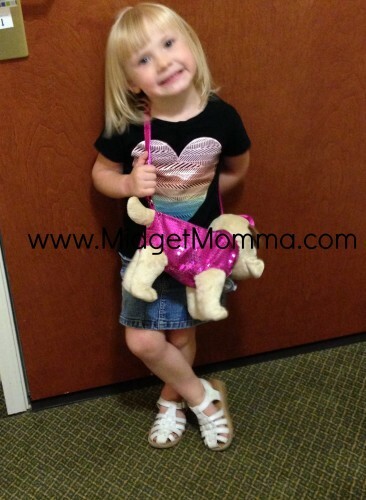 Recently I was contacted by a company, Poochie and Co. about the purses they make for young kids and when I saw them I knew they would be perfect for Alyssa. You can pick from different dog styles and cat styles and pick the one that is best for your little girl. Since we got it Alyssa has brought it everywhere we have gone. What I like about it other than it being super cute is that the pouch part is big enough for her to bring all the stuff she likes to bring with us, her fake cell phone, her coupons, her notebook and her Bitty Baby needs (Bottle, extra diaper ect) because Bitty Baby comes along with us too! You can purchase these super cute purses on Amazon here for between $10 – $20! Disclaimer: I was provided a product free of charge to facilitate my review. No compensation was received and all opinions are 100% my own.